Few modern collectors know of the Nu-Card company, who made a handful of sport sets in 1960 and 1961. 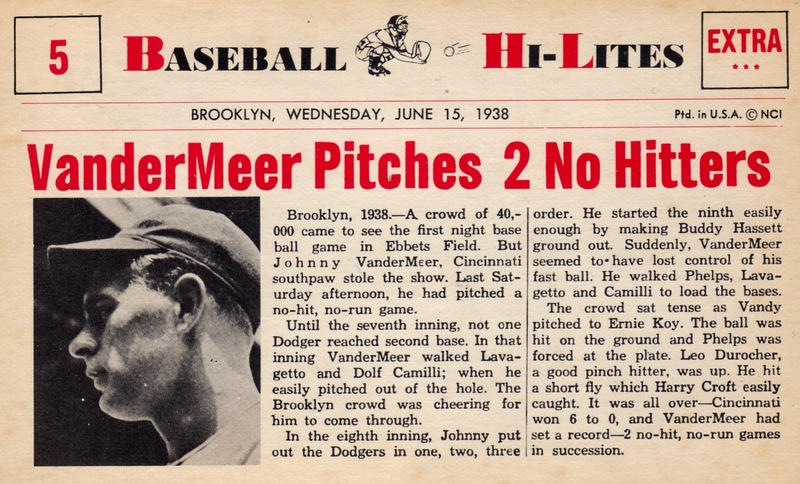 Both of their baseball issues ("Hi-lites" and "Scoops") feature a newspaper format with single-game "stories," a mix of retired and active players, and trivia questions on the back. 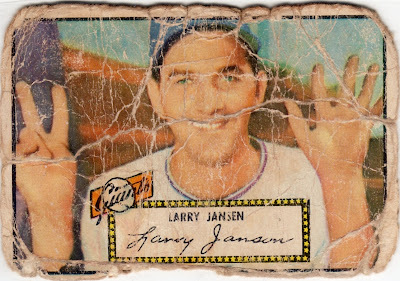 Many of the set's 72 cards point elsewhere in the set. 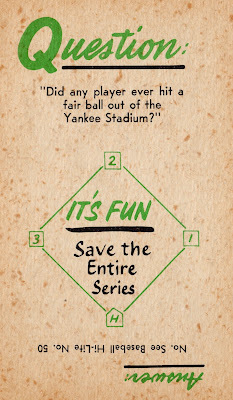 Number five redirects this Yankee Stadium question to #50, which covers its longest recorded homer. 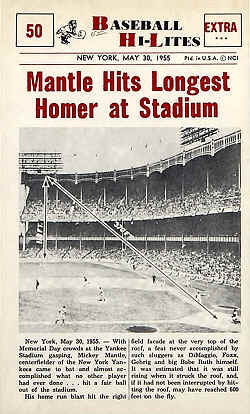 Mantle's homer hit Yankee Stadium's upper facade, a near-miss to leaving the park itself, a feat no player achieved in a regulation game. 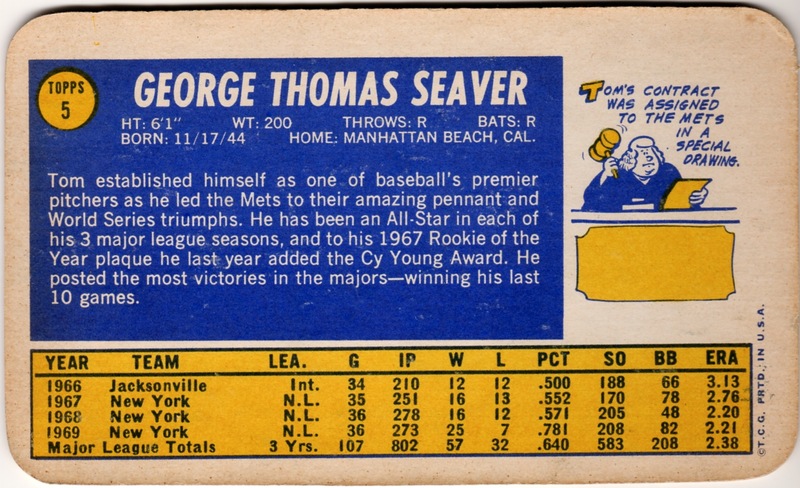 An alternate black-and-white printing of this set covered just the first 18 cards, came with blank backs (eliminating the trivia questions), and carried the CVC copyright instead of NCI in the "newspaper" header. 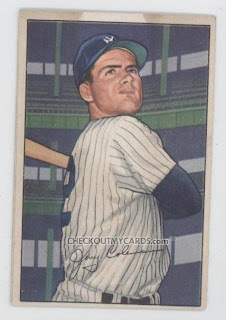 Price guides report CVC cards as scarcer than NCI, but both cost about the same thanks to the variation's crudity and low demand for this set in general. 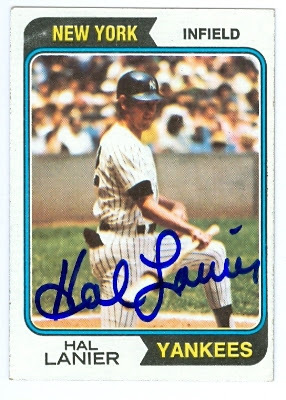 Value: You can find individual "hi-lites" for $5 and less, with some superstars running several times that. Fakes / reprints: According to the SCD catalog, someone counterfeited the 1961 Nu-Card Scoops set (released the year after this Hi-Lites issue), but I haven't seen any faked 1960 cards in the market. For most collectors, baseball means stackable, sortable 2" by 3" rectangles of cardboard. 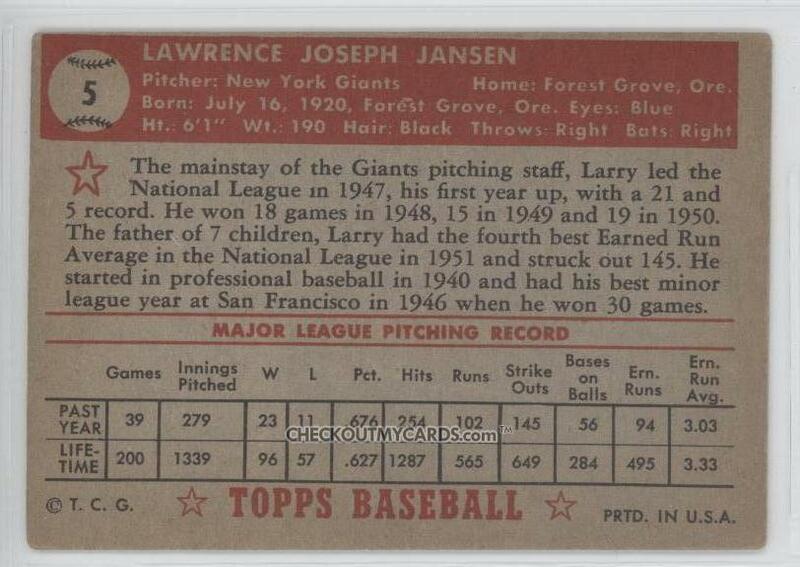 Topps prints an apparently unending supply these days, year after year, reliable as death or taxes, with competitors Panini and Upper Deck major factors in other sports. While this hardly excludes other shapes, even the word "card" implies something squared-off and angular. Today's #5 eschews both descriptions. 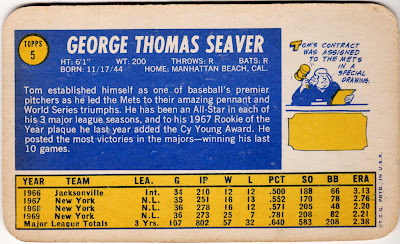 Rectangle cards remain primary, but aren't the only kid on our block. Turn back your clock a bit and remember that new discs turn up every decade or so--four specific eras come to mind. 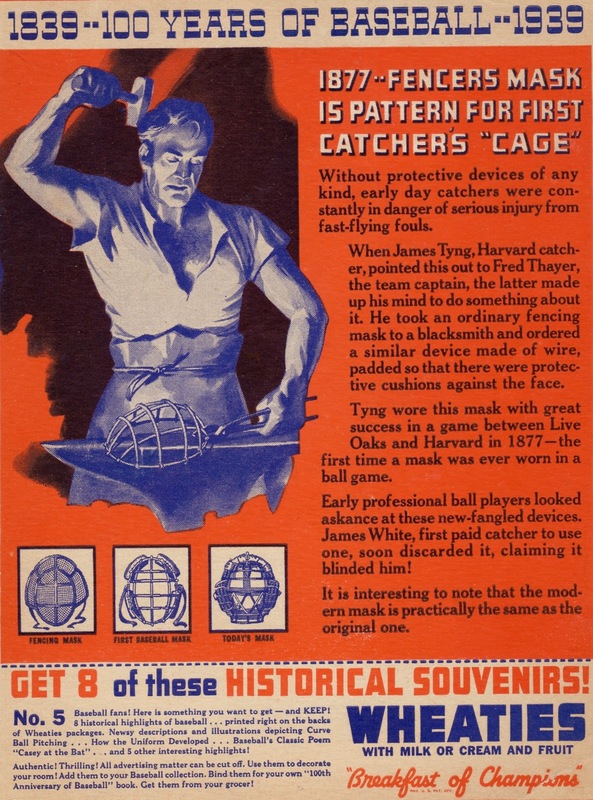 Pre-war disc sets also exist, usually as dessert or snack lids that kids pulled off and (ideally) hung on to. 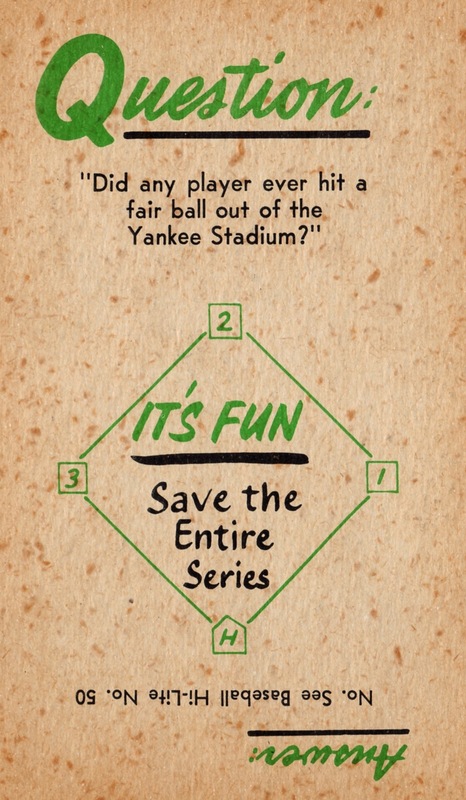 They're close cousins of cereal box panel and other food promo sets, since nothing about Papa Gino's pizza or raisin bran explicitly says "baseball." 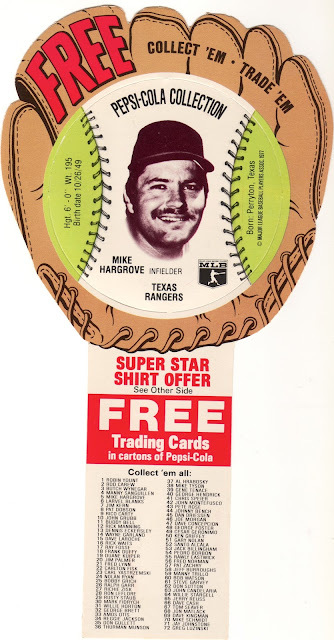 MSA (Michael Schechter Associates) is the same maker who licensed a larger version to advertisers in 1976-1977, including Pepsi's 1977 capliner cards (#5 Mike Hargrove profile). 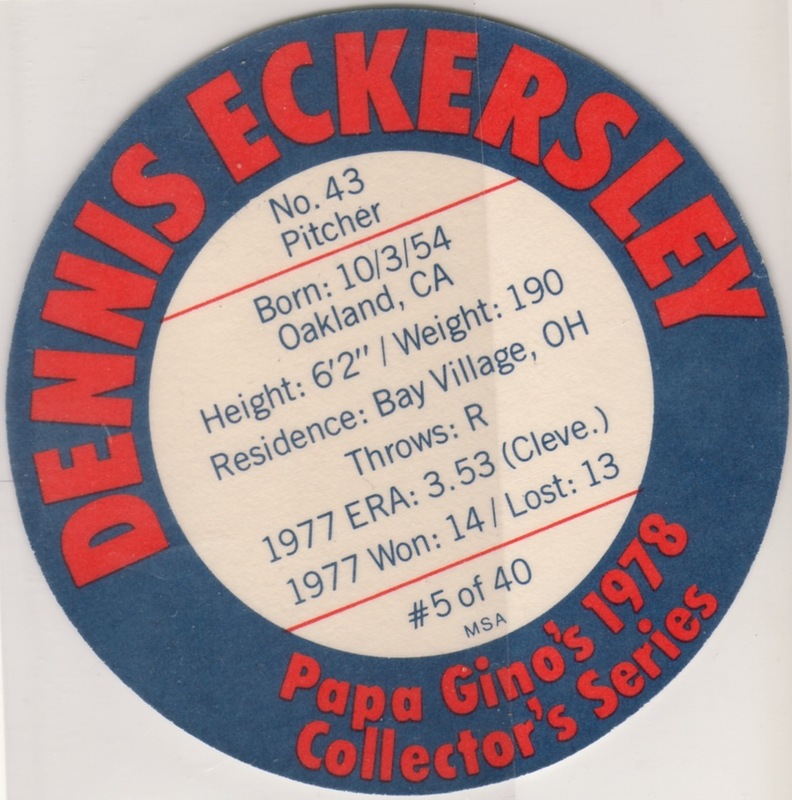 Papa Gino's sponsored this 40-player set and customers could get one (or more) with each meal. I assume it proved successful, since they turn up at shows and online frequently. 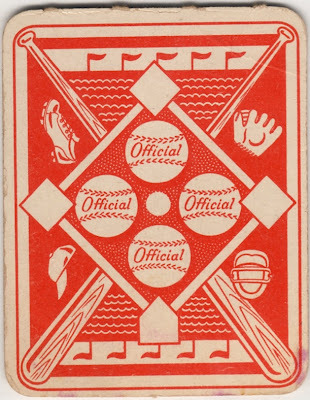 Value: Complete sets list for as little as $20, so singles should cost a few dollars at most. 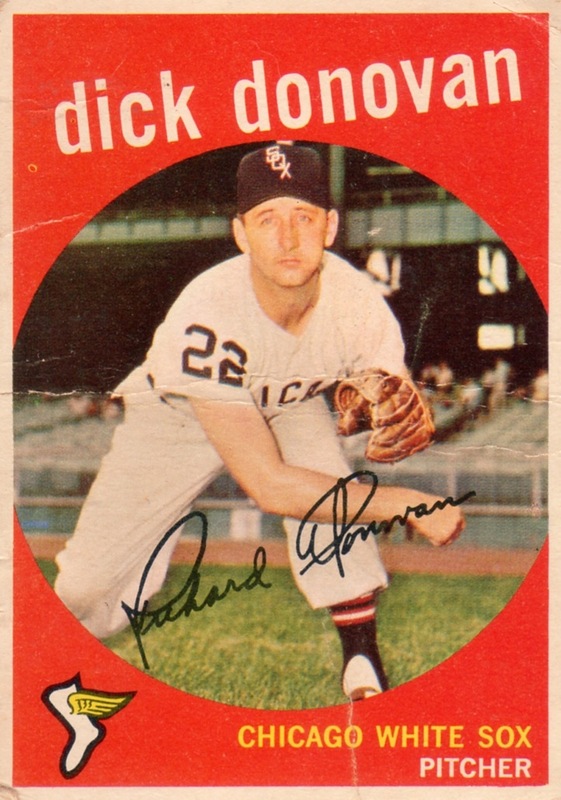 Fakes / reprints: This would be a hard set to reproduce, given low collector interest and value. I haven't seen any in the marketplace. Happy Thanksgiving to my 2010 readers! 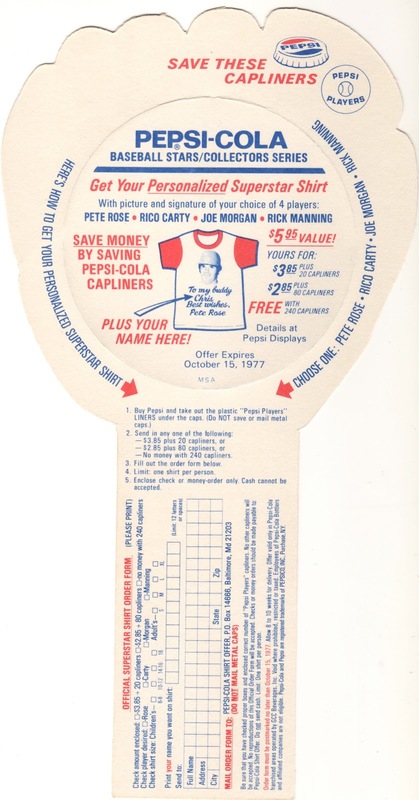 Here's a food-related issue for everyone to warm up with before that third serving of turkey comes around: the 1977 Pepsi-Cola Baseball Star discs, shown with perforated "capliner." Pepsi inserted these gloved discs one per carton, intending collectors to punch them out for easier storage. 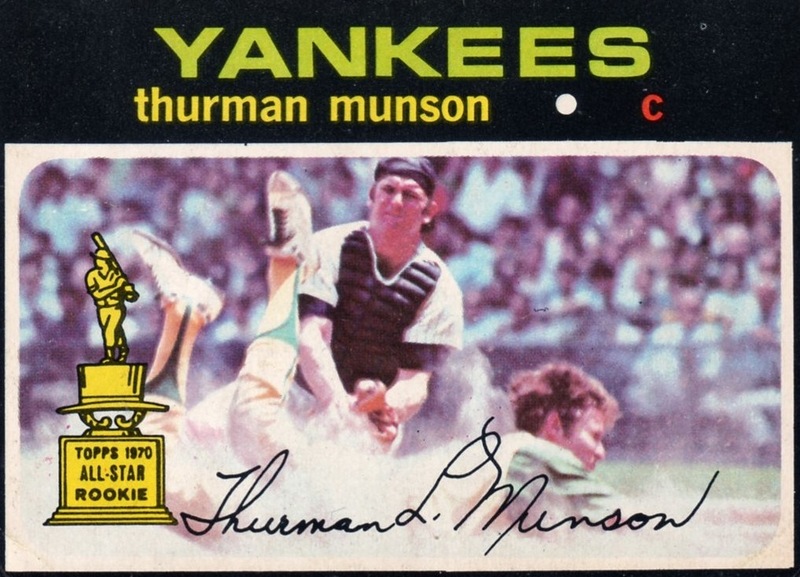 The included checklist numbers to 72 players, but Reggie Jackson and Mike Schmidt each came in 5 color variations, for a master set of 80. 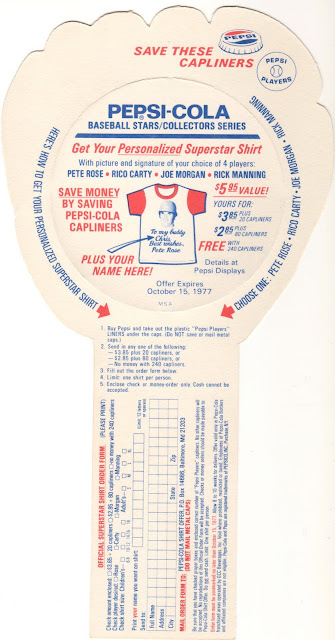 I've never seen one of Pepsi's personalized shirts for sale, which either means they weren't worth saving or few people took the trouble to send away for one in the first place. 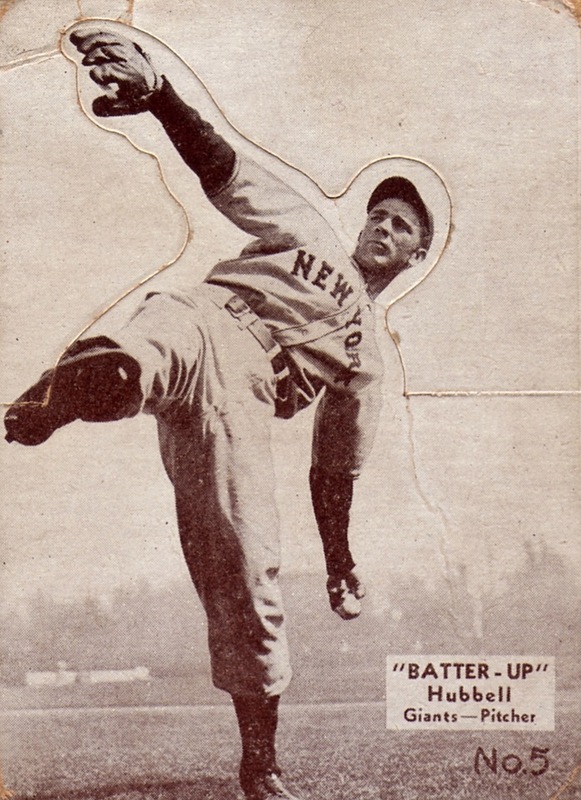 Value: As of writing, many eBay sellers list disc-with-glove HOFers for $5 and under. This remains an affordable (if plain) set to put together. 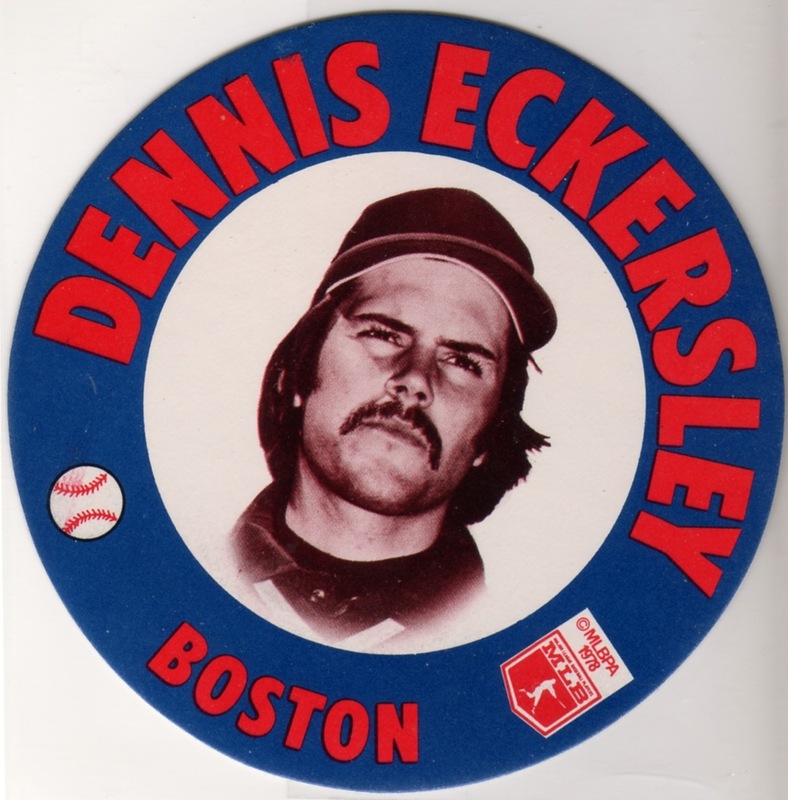 Fakes / reprints: Several makers created baseball disc sets, but they're not actually reprints. Check for company names on the front or back to distinguish them--many collectors try to complete a set of specific advertisers. 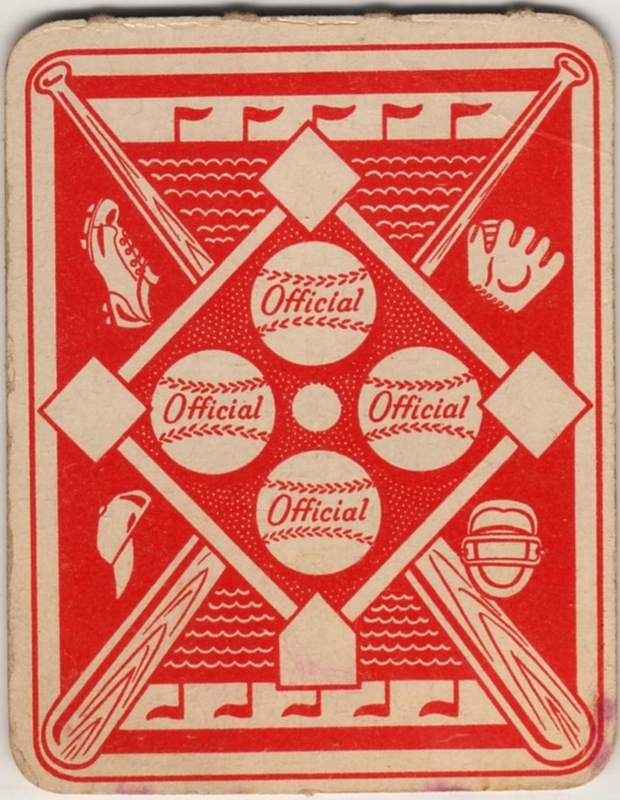 For most of the late 1940s, California's Remar Baking Co. produced annual team sets for Oakland's Pacific Coast League team, the Oaks. In 1947, they doubled up with Smiths clothing store, as both companies distributed similar 25-player collections. 60 years later, these cards are about all that remains of both companies, other than some photos and one factory building! Speaking of Oakland managers, Chuck Dressen took over the Oaks when Casey turned his 1948 PCL title into a job with the Yankees. Mr. Dressen won his own championship in 1950 and immediately jumped to the Dodgers for 1951. 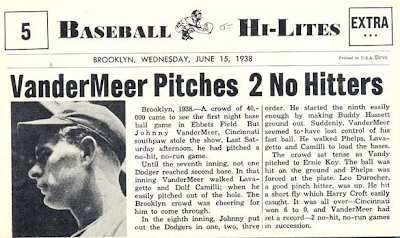 These former Oaks-men proved so successful in New York and Brooklyn that they met for two World Series (1952 and 1953), with Stengel taking both. Value: Lloyd Christopher cost me ~$5 on eBay. Casey Stengel and Billy Martin are the "stars," so run several times more. Fakes / reprints: Haven't seen any reprints of Smiths cards in the marketplace. 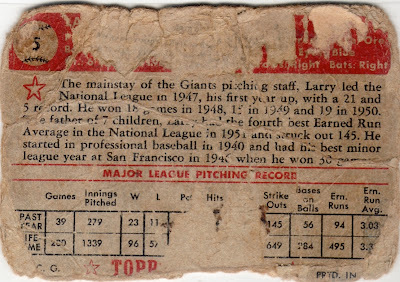 Earlier today, blogger Night Owl kicked off a series called "Here's Your Top 60," which critiques Topps' flawed 60th Anniversary contest. 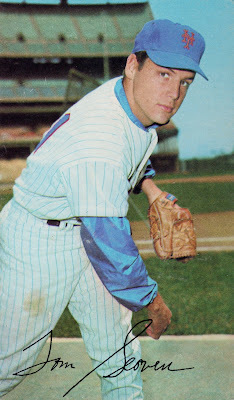 He includes an initial gallery of 20 great cards (with more to come) and spurred me to find some of my own. 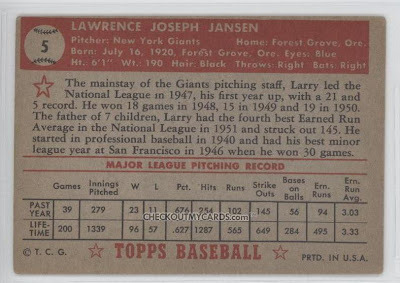 Night Owl's perspective of what makes a great card stands in welcome contrast to Topps plan of reprint every Mantle one...more...time. 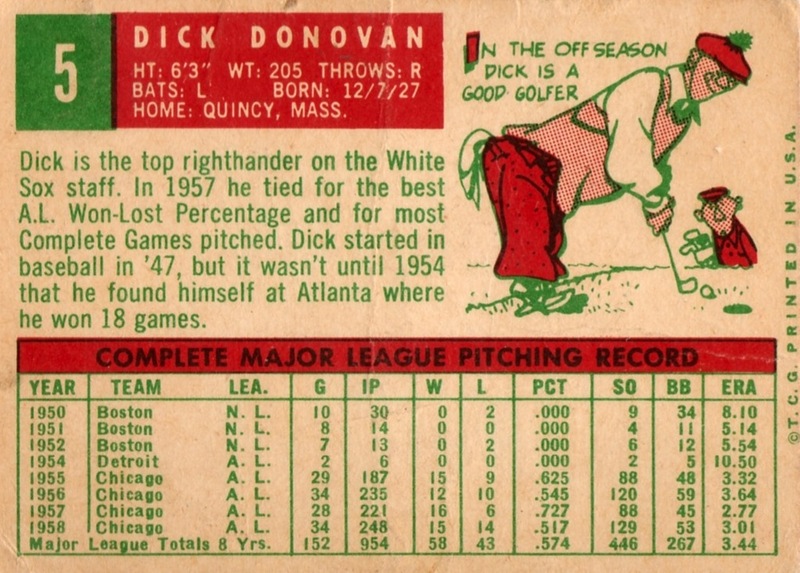 And even if they do keep Mickey on the payroll, why leave out this legitimately great card? 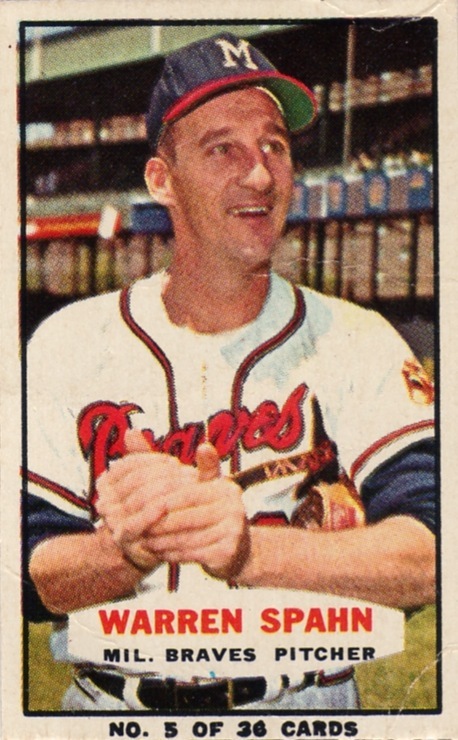 Topps bought out Bowman's assets back in early 1956! Thick-lined borders make The Mick jump off this card and I love the cloudy sky. Doesn't matter to me that it's his first card, but it should to Topps and Bowman, as "Home of the Rookie Card!" 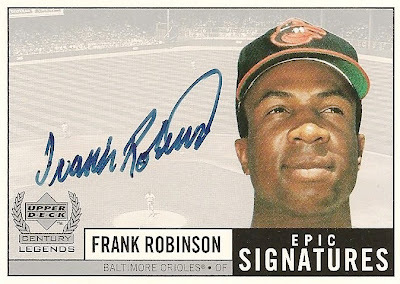 Picking "best ever" cards means more than "most expensive" and "most popular." Subtle combinations of pose, design, and context can make for awesome results. Even my focused group of #5s includes several choices that improve on Topps' nominees--the following handful of players represent my top 5. Poses like this turn a single moment to something iconic. 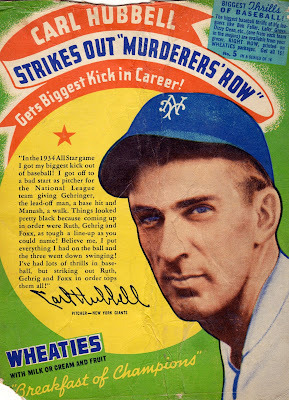 Hubbell's windup is Evel Knievel's motorcycle flying over 20 cars or Bo Jackson running out of the Kingdome. 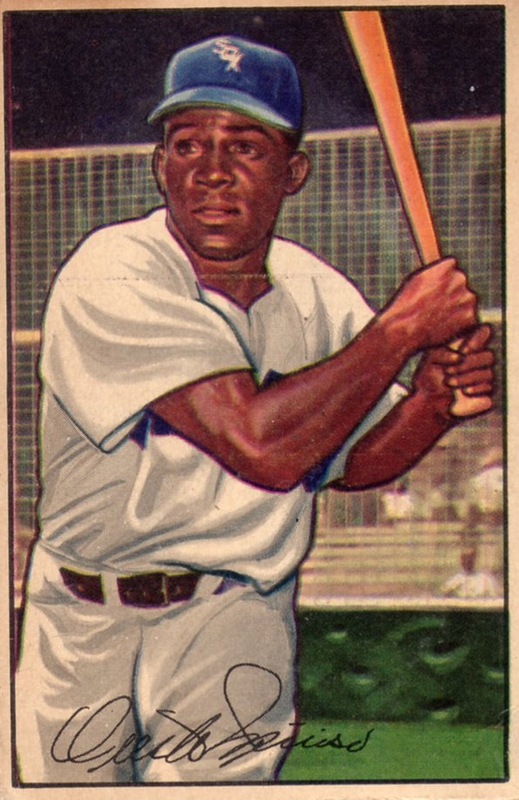 This wonderful piece of art happens to be 5-decade player Minoso's rookie, but I just love its post-swing detail and optimistic look over the collector's shoulder. 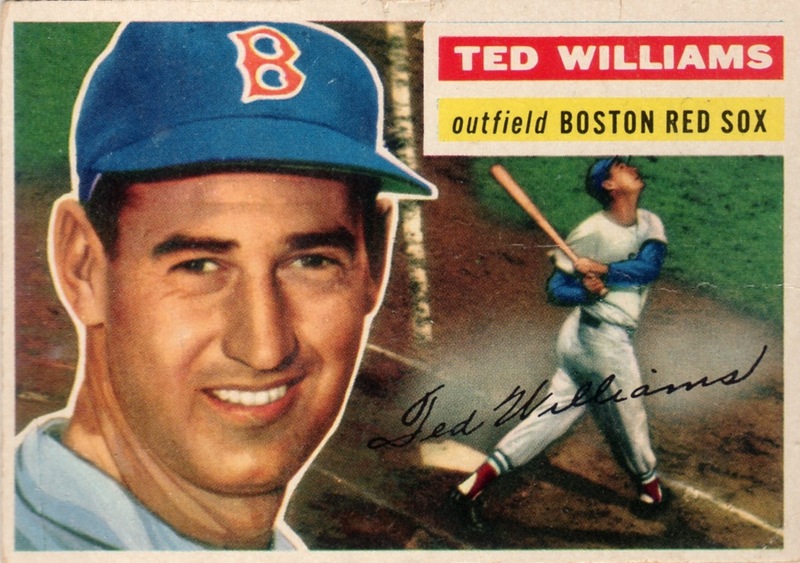 The best cards remind you of complete baseball stories, like Ted Williams' career in Fenway Park. Its unusual dimensions helped The Splinter thrill fans year after year, even if Boston could never deliver a title. 1956's whole set is a wonderful collection of cards, driven by competitive pressure from then-rival Bowman. Topps should include Bazooka sets in their retrospective--after all, they've owned the gum brand from day one! 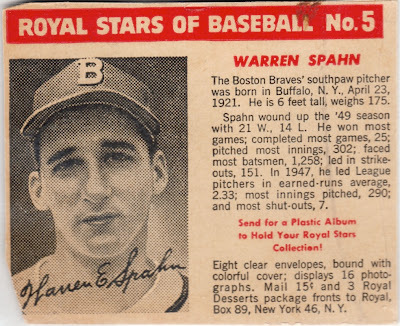 Smaller cards don't have to mean lousy pictures, as this Spahn amply demonstrates. What a great action shot! 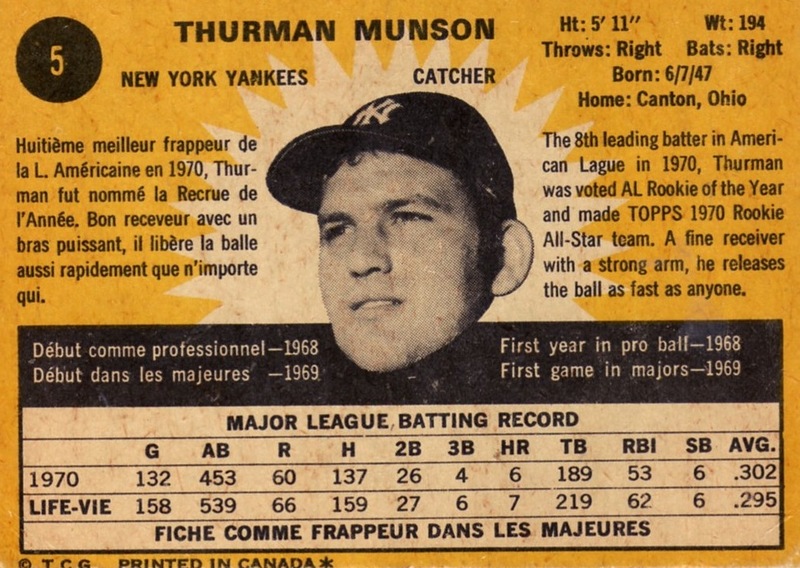 You could pick Topps' own #5 based on the front alone, but I wanted OPC's lemon-flavored back and its invitation to learn "Rookie of the Year" in French. 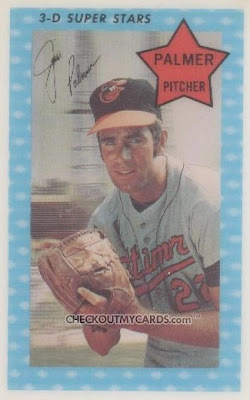 This barely scratches the surface of awesome cards. Got some favorites of your own? 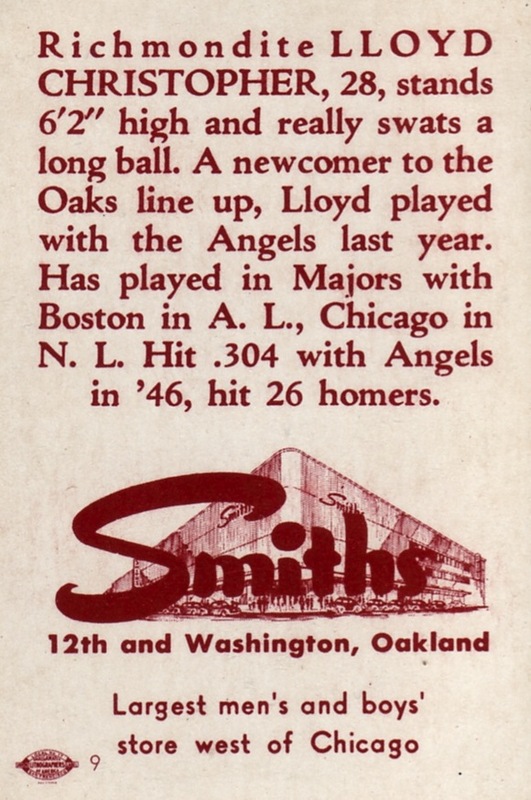 As a charter member of the Pacific Coast League, Oakland's Oaks were in their 5th decade of play when WWII ended. 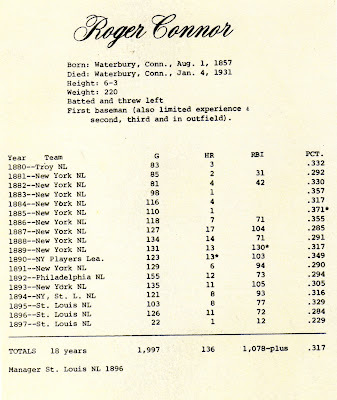 Many considered the PCL a "third major league" in talent level, but clubs rarely affiliated directly with MLB counterparts and worked hard to build and maintain quality rosters. 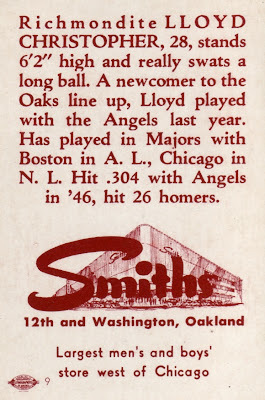 Oakland made a brief alliance with the Yankees in the mid-30s, but their biggest contribution to New York followed the era pictured on today's card. 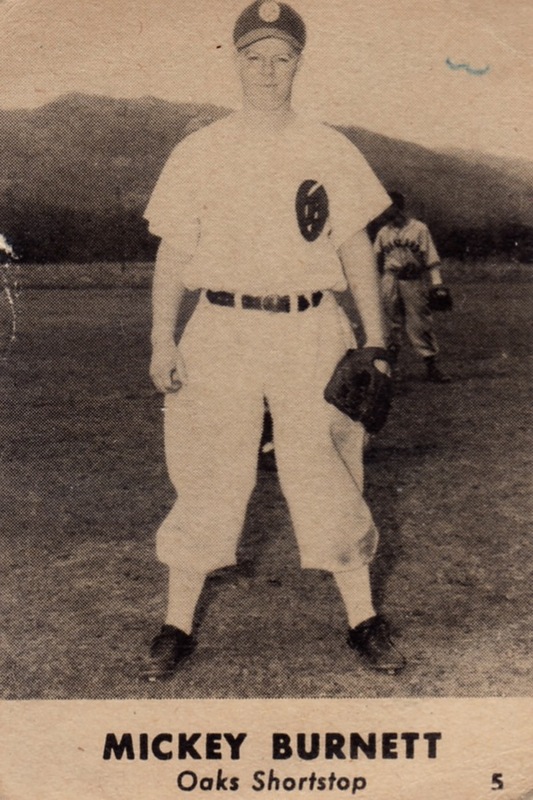 This two-sizes-too-big uniform makes Mickey Burnett look more like Mickey Rooney, or maybe "Dorf on the Diamond." 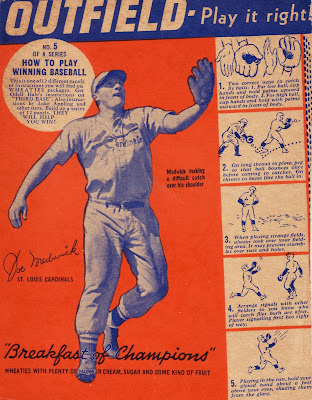 (Smaller PCL revenues meant simpler uniforms and maybe--just maybe--ones that didn't fit so good.) Western teams often played in the looming shadow of mountain ranges, an alien sight for 1940s MLB teams. 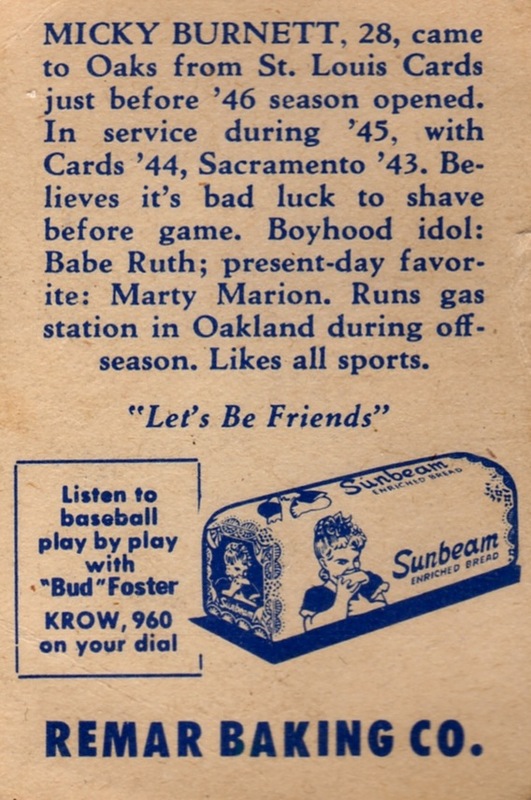 Baseball history fans should check out the Oakland Oaks of 1948 fan site, 1946 PCL intro movie, and (for PC only?) 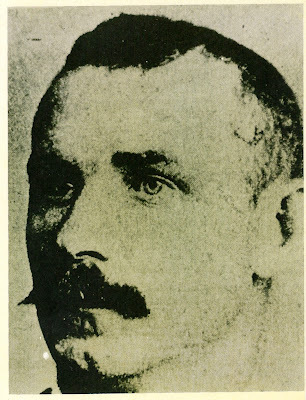 the 27-minute Casey and the Nine Old Men documentary. 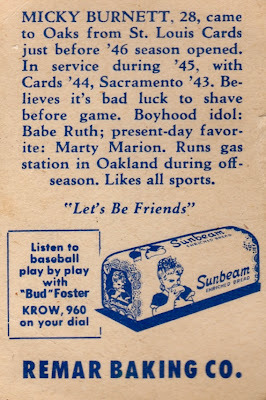 This wealth of videos, photos, and player profiles fills out a story I can only touch on. 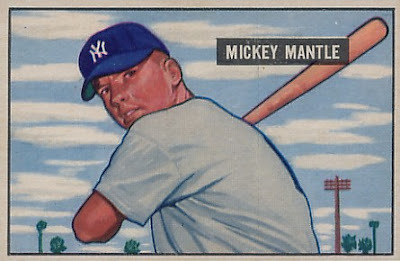 Value: Less-heralded players like Mickey cost $5 or so in low grade. 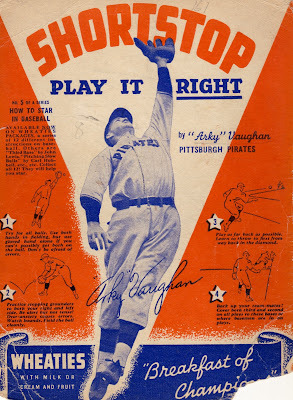 Casey Stengel is about triple that as the set's "star." 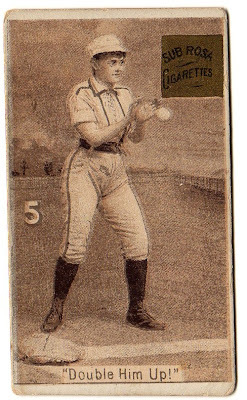 Fakes / reprints: While not impossible to find, Remars are rare enough that collectors might've reprinted them, especially the Stengel. Set builders in high grade should familiarize themselves with similar sets and buy from experienced dealers. 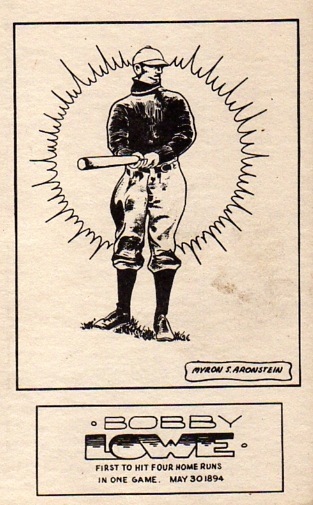 At the 19th century advent of baseball cards, business owners didn't consider kids a useful target audience. Only adults earned money and owned stuff, so why go after customers who have to scrounge for pennies? This seemed sensible to tobacco companies at the turn of the 20th century, but candy companies would take over their market within a generation by targeting that small change. Paper boxed products made excellent card material and Royal Desserts is just one of many companies to take advantage of baseball cross-promotion with this 24-player set. Collectors trimmed away "extra" cardboard, which often included portions of the player himself (see my Spahn). Full boxes closely resemble JELL-O's 1962 set. Value: Mis-cut versions of stars cost up to $20, with nice ones running more. Complete boxes can cost a lot, given their rarity. Fakes / reprints: This would be an easy set to fake, so familiarize yourself with its players and variations before making a big purchase. A few years before co-founding TCMA, Mike Aronstein self-published a handful of sets under the moniker Sports Cards for Collectors. (Some catalogs and sellers shorten it to SCFC.) 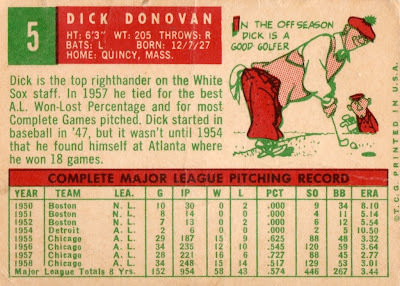 Most feature old-school players, either hand-drawn or reprinted from vintage photo negatives. 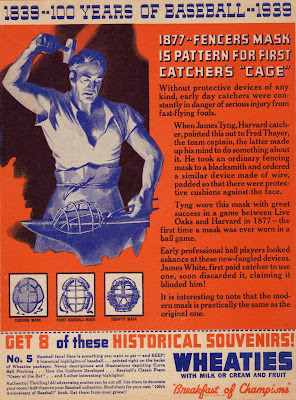 Today's "Sport Stuff" set recalls guys who played prior to 1920, the last of whom probably passed away around the time it came off the press. According to a 2009 interview (read it here), Mike's uncle Myron Aronstein drew these originals. Number 5 is 19th-century second baseman Bobby Lowe, who starred for the Boston Beaneaters, ancestors of today's Atlanta Braves (B-R franchise page). 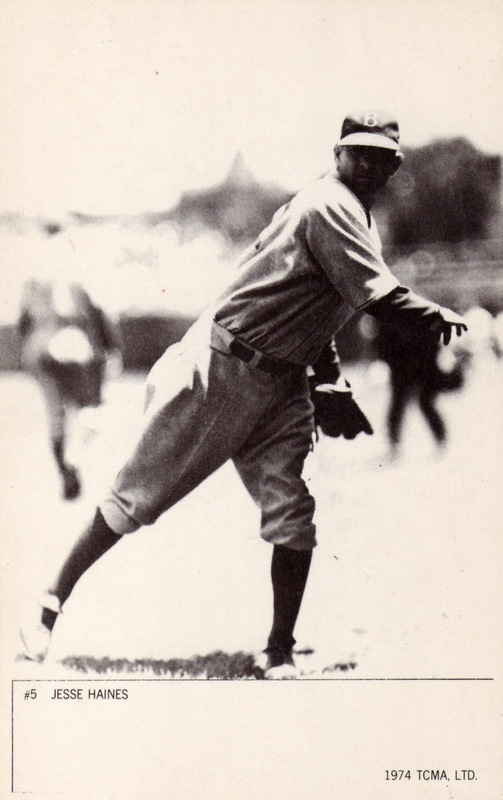 Others in the postcard-sized set feature multiple players, like #6 Tinker to Evers to Chance below. 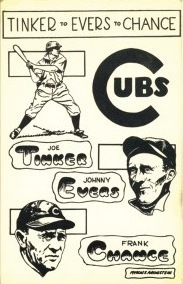 If you don't already know about this classic Cubs infield, check out these set profiles. 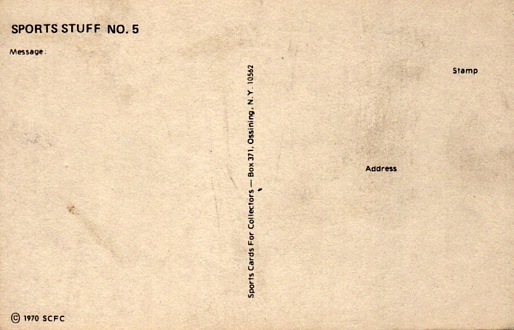 Value: This postcard cost $10 on eBay, one of the few I've seen offered singly. 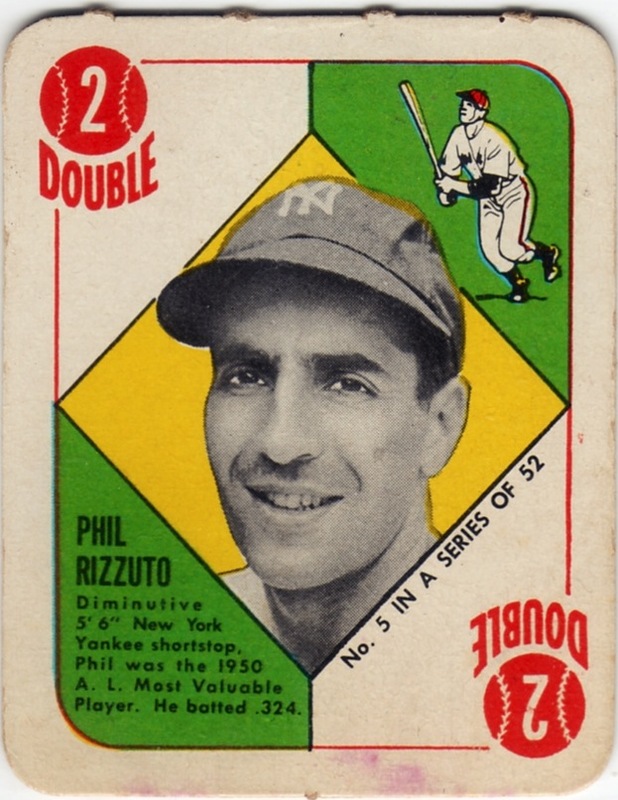 Full set closing prices at auction sites range from $70 to $100. Fakes / reprints: Doubt there's enough demand for reprints, but it wouldn't be a hard set to fake, so look for authentic wear and know your dealers. This photo captures a wonderful classic uniform, including short-billed cap, bloused pants, striped socks, jersey piping, and bear-in-the-C Cubs logo. When teams host throw-back nights, this is exactly what I hope to see on the field. 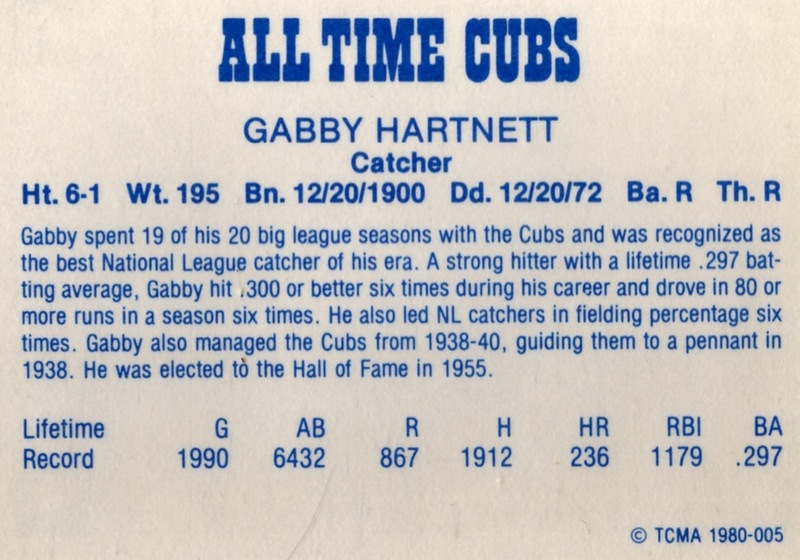 HOF backstop Gabby Hartnett hit well for a catcher and played stout defense, an ideal combo for any lineup. 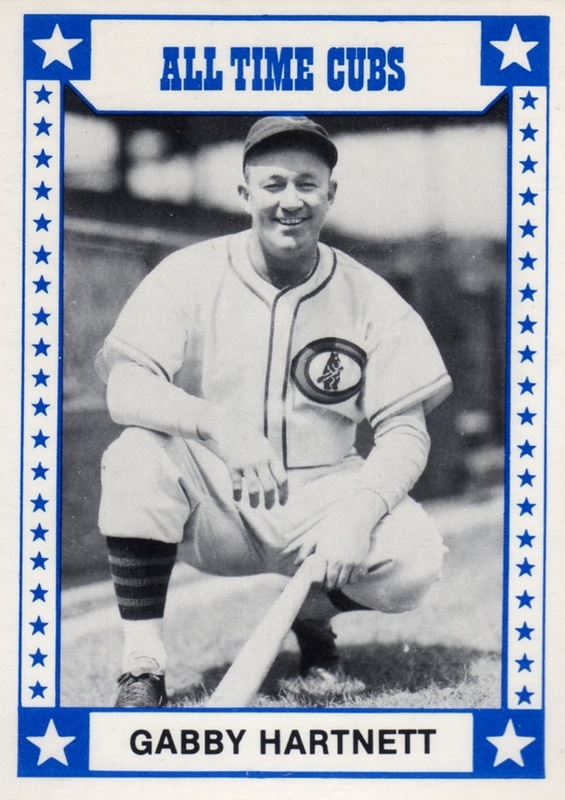 He frequently garnered MVP votes and finally won the NL award in 1935, at age 34 (!). 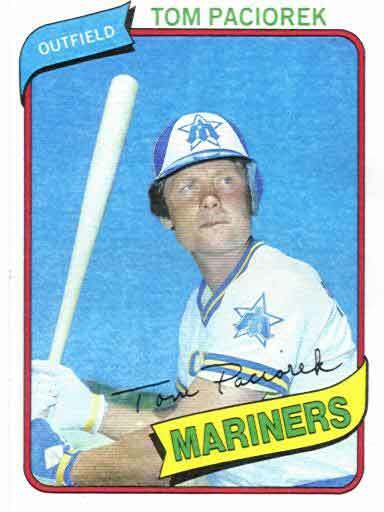 There can't be many catchers who give their strongest seasons after 30; even "Young Pudge" Rodriguez won his MVP at 27 and "Old Pudge" Fisk never finished higher in the voting than 3rd. 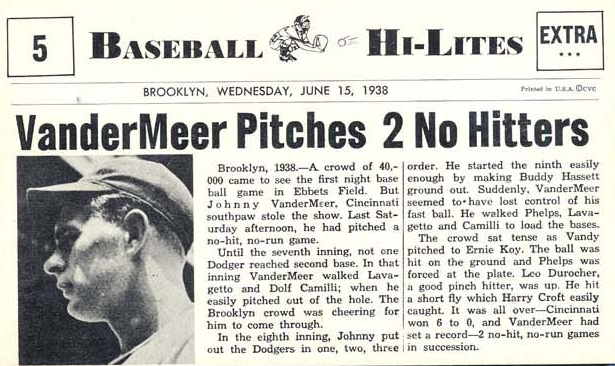 As the bio notes, Hartnett spent one year (his last) away from Chicago, catching part-time and pinch-hitting for New York's baseball Giants in 1941. 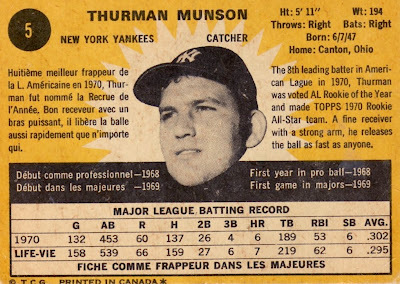 He could still hit and catch, logging a 119 OPS+ and .994 fielding % in 34 games, but they released him at year's end. 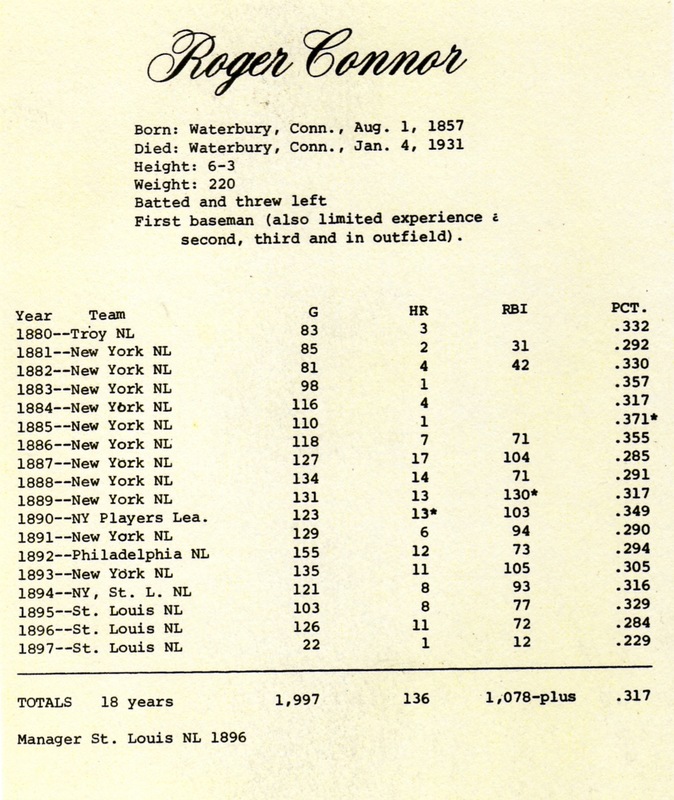 Here's the 12-card checklist, with 8 position players, 3 pitchers, and a manager (3 time pennant-winner Charlie Grimm). 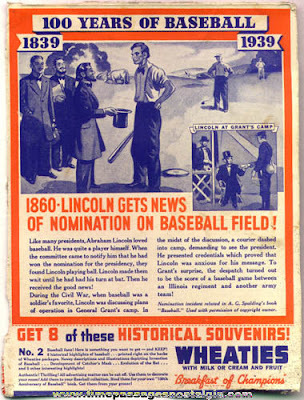 Note that Grimm also player-managed for Chicago from 1932 to 1936, preceding Hartnett's 3 years at the helm. 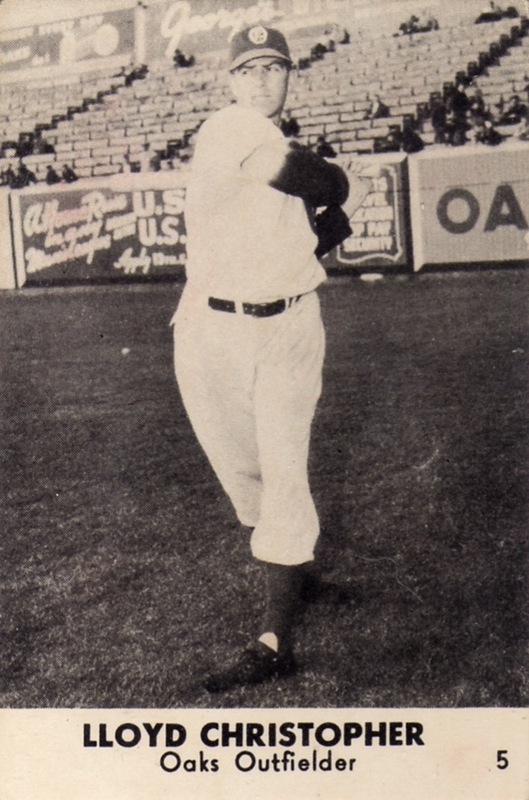 Charlie went on to serve a second stretch from 1944 to 1949 and took them to the infamous "Curse of the Billy Goat" World Series in 1945. 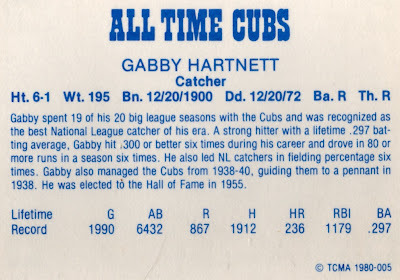 Value: Singles run a dollar or two, as with other TCMA All-Time sets, and I expect HOFers like Hartnett and Banks to cost somewhat more. 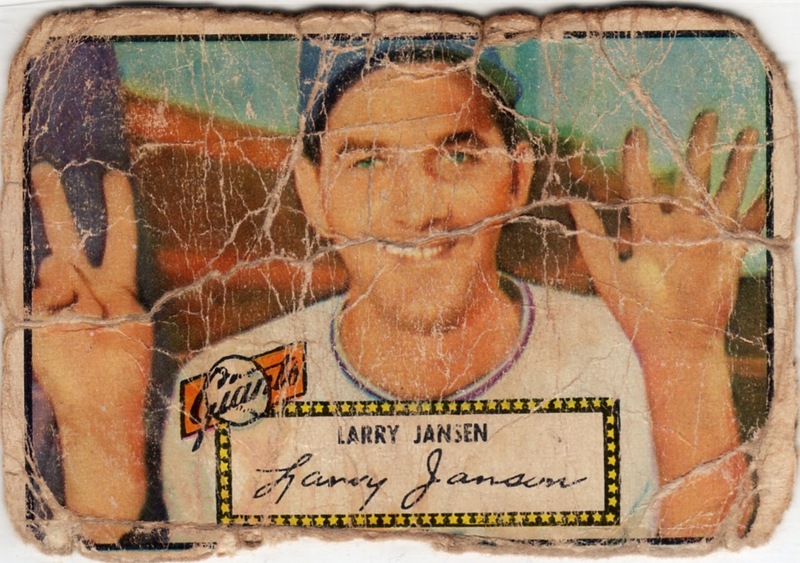 Fakes / reprints: Don't expect to see any in the market, given the set's low profile and value.